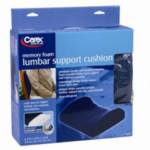 The Carex® Lumbar Support Cushion is ergonomically designed to provide support and help relieve lower back pain. This versatile cushion promotes good posture and can be used at home, at work or when traveling. Made of high quality, high density self molding memory foam, this support cushion has a strap to secure it to a chair. The removable soft polyester and rayon cover zips off easily for machine washing. Hypo-allergenic. Blue support cushion measures 13" l x 12" w x 4.3" h.